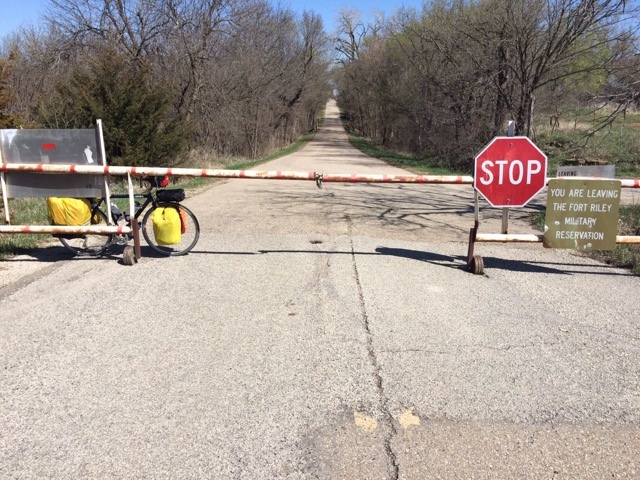 MY SIDE OF THE RIDE: Honest, Sir, I Thought It Was OK To Ride This Road. I Mean, The Gate Was Open, Sir. Honest, Sir, I Thought It Was OK To Ride This Road. I Mean, The Gate Was Open, Sir. 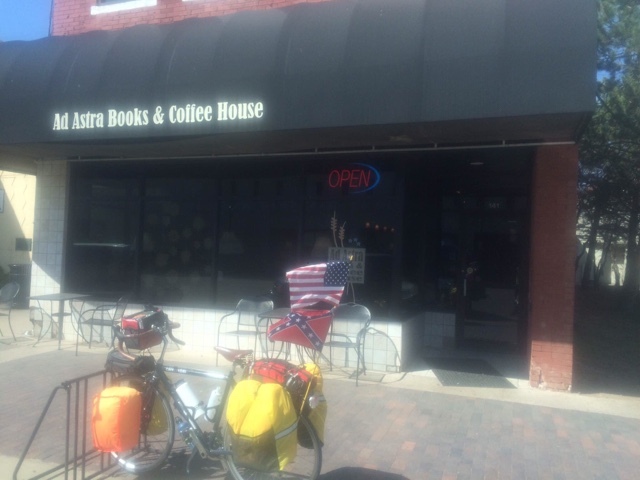 After leaving Sam/Maggie's house, I stopped for espresso and a bite to eat before leaving Salina. Good food, very good espresso. Hard to find espresso shops that make good espresso. Most are not proficient at making espresso and the results tend to be terrible. 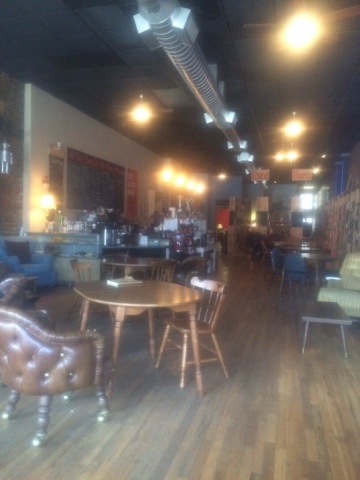 This is the second espresso shop I found that was good. First one was in Canyon, TX...The Palace. My next stop was Junction City, KS, just south of Manhattan, KS. The ride that day was decent as long as I was headed East. Those times when the road headed north...my friend, the wind, slowed me down considerably. Gratefully, the road mostly went East/Northeast.. When I told a guy in Abilene where I was headed, after he'd asked me, he said, "Oh, Junk City, eh?". Was that a warning??? Got an early start and promptly ran into a gate to Fort Riley, where a yound soldier politely let me know that, without a military or Dept. of Defense ID badge, I was going nowhere on base. The good part was that I'd only gone about 3+ miles before discovering this fact. No maps show what roads are closed off due to being on the base and Google Maps was all screwed up. Because of Fort Riley??? Who knows. No cellular, no wifi, no nothing. After going back to the main road I'd been on, my cell phone worked well enought to stop at one of the ubiquitous convenient stores where I bought a banana, a donut, and some coffee. While eating/drinking, I looked on Google Maps...the map showed a road that I could take which would bring me out just south of Manhattan, where I hoped to get a bite to eat, then head to Topeka, KS. Old Highway 77. Pretty road. Quite a few rollers. Some significant and made me breath hard. 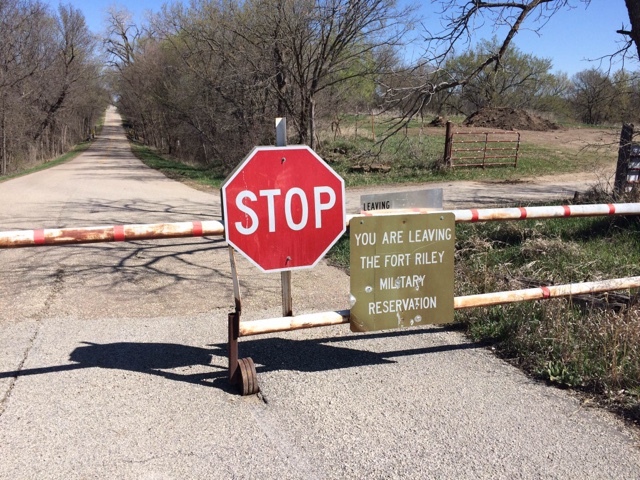 Then, on my right, I passed another gate to Fort Riley, but the road ahead was open. No gates. Traveling on for about half a mile, for probably a total of 10+ miles from U.S. 77, there was a sign to my right stating that no civilian without a proper military or department of defense ID could continue on this road in another half mile. Learned a few new combinations of curse words. Always look for the positive in a negative, I say. So, I get to where there is a gate across the highway, with a sign just past it that stated, "Tank Crossing". Not in Civilian Kansas any more, Dorothy! Well, damn it... There was a small kiosk there, sort of like the ones at the beginning of hiking trails with all the appropriate info for hikers to read. Well, this one had a map of Fort Riley, with two areas marked, "Off Limits". One that was to the right of the road was the artillery range. The area that the road went through went in between these two off limits areas and, during hunting season, locals are allowed in to hunt after getting permission from the military. Keep the locals happy, I say. A phone number was posted to call to see if the road was open. I called it only to hear a recorded voice stating I needed to look at the online posting to see what was open. Duh, no wifi, no cell phone coverage. To help clear my mind, I went behind the kiosk to pee. Mind clear, I headed down the road. Now, my heart was beating faster than normal at this point. I mean, it was my first real adventure on my road trip! Heart beating fast, I was also pedaling faster, too. Not too far down the road there were what looked like military observation posts??? How was I supposed to know what the hell they were??? Oh, and I have no photos of the open gate or the kiosk either. Or of the road that I was on. The last thing I wanted on my iPhone was any photos of the fort. No, Sir, I'm not a spy. Really. What are the photos on my phone? I wanted to show people where I was riding. Are the handcuffs really necessary, Sir? The first two photos are from the military base side. The last one is from the civilian side. I went back under the gate to take the first two pictures. I wanted to be on the civilian side quickly! What a ride! 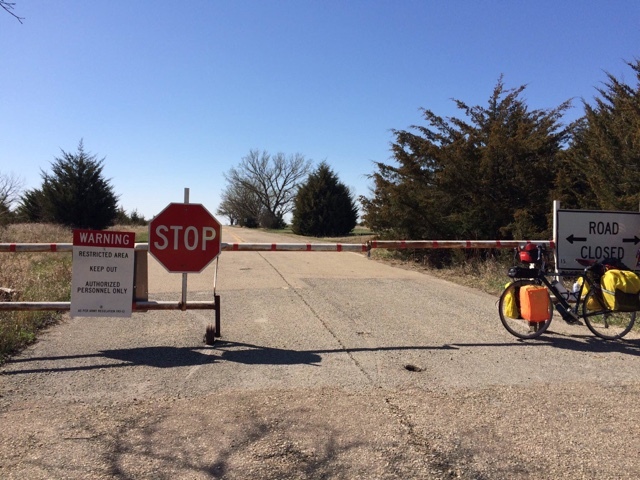 If the gate had been closed like this one was, with the signs that are on the gates here, I would have turned around and headed back, realizing that I would only get to Manhattan to spend the night, pushing my arrival at my mother-in-law's (Marilyn Sullivan) to Monday. And I didn't want to ride into Kansas City on a weekday considering the size of the city and the traffic in a big city. Not sure why, but it's the first tune that comes to mind when I think about the military. Not to be disrespectful, believe me. Sort of like why I have the Confederate flag, and the U.S. flag, on my bike while doing this ride. It really is to honor those who died. Not to represent what those flags mean to any particular person or group, good or bad. This song speaks to the futility of the deaths in Vietnam. Perhaps the futility of any death as a result of war. Think of what we lost as people, family, spouses, children, friends, and communities all over the world from war. Devastating. Next, a week in Kansas City!